On May 24th 1962, Lt Commander Scott Carpenter orbited the earth three times aboard the Aurora 7 capsule. On his wrist was a Navitimer featuring a 24-hour graduation serving to distinguish day from a night – an absolute necessity in space. 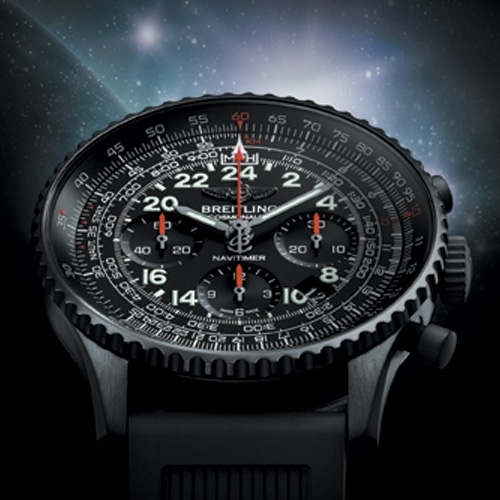 This space conquest pioneer joined the Breitling collections under the name Cosmonaute. 50 years after its first flight in 2012, the Navitimer Cosmonaute is pursuing its odyssey in a new and highly original version featuring a case in black steel created using a highly resistant carbon-based coating. The dial and counters of this high-performance chronograph are in the same black color, enhanced by luminescent indications and small red hands. The Manufacture Breitling Caliber B02, chronometer-certified by the COSC (Swiss Official Chronometer Testing Institute) features two key characteristics true to the original model: a manual winding system and a 24-hour display. The famous Navitimer circular slide rule enables pilots to perform the entire range of calculations relating to airborne navigation directly on the wrist. The engraved caseback bears the official Aurora 7 mission insignia. Issued in a numbered 1,000-piece limited series, the Navitimer Cosmonaute Blacksteel is fitted with a black rubber strap further enhancing its tech-savvy, masculine appearance. Movement: Manufacture Breitling Caliber B02, officially chronometer-certified by the COSC, mechanical hand-wound, high-frequency (28,800 vibrations per hour), 39 jewels. Over 70-hour power reserve. 1/4th second chronograph, 30-minute and 12-hour totalizers. Calendar. Case: black steel, 1,000-piece limited series. Water-resistant to 3 bars. Bidirectional rotating bezel with circular slide rule. Cambered sapphire crystal, glareproofed on both sides. Strap: black rubber Ocean Racer (perforated).